Famed chef Wolfgang Puck has made food for everyone from politicians, world leaders and even Hollywood's A-list. Born in Austria in 1949, Puck was surrounded by people in the food industry from an early age - his mother worked as a pastry chef and he learned many of his cooking skills from her. Puck worked at restaurants in Monaco and France before he eventually moved to the United States in 1973. After setting up shop in Los Angeles, Puck had a number of successful restaurants under his belt including the celebrity hot spot Spago. 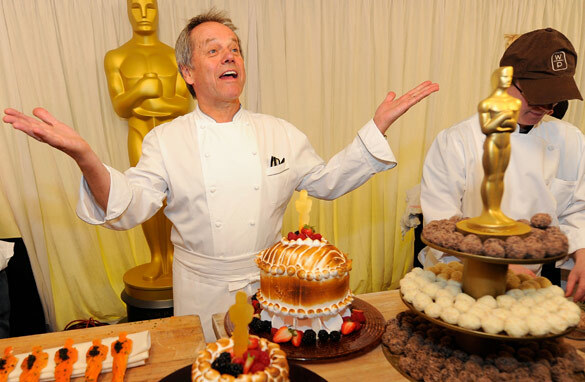 But it is the Academy Awards that has led Wolfgang Puck to global fame. Puck is the official caterer to the Academy Awards Governors Ball and has cooked for everyone from Arnold Schwarzenegger to Tom Cruise. As another Academy Awards comes, this is your chance to have your questions answered by this world-famous chef. Perhaps you want to know what's on the menu this year? Maybe what celebrity is a difficult eater? Please leave your questions for Wolfgang Puck below and be sure to include where you're writing from. –	How will your food Improve our world? I am awaiting Wolfgang Puck’s replies. What's the right way to boil an egg? I have tried many sour dough bread starters but none of them give the bread that sour dough taste, what can you suggest? Firstly let me congratulate the chef on his many achievements , and the latest one too.. Congrats Chef!!! Well as for what I would like to ask chef..
Having more and more people who want to be chefs or just love to cook today.. what adivce would you give them? Do you like eating your own food or you prefer eating else where? Once again , congrats chef and all the best.. Excited & inspired...bought one of your omelet pans at TJMaxx while visiting the States. One week later it was peeling and pitted never having used abrasive cleaners, sponges, or metal utensils. Very disappointed...bought a Borgeat online to replace it...be careful where you place your name. What came first; the chiken or the egg? How is your pizza going to save our planet from tragedy? What's the secret to making Kaiserschmarrn? Why does the food in your restaurant in Las Vegas taste so bad? I was disappointed. Hi Wolfgang! I'm living in Vienna and I feel so proud of you, that you're from Austria and have made it big time in the US! You inspire me somehow. I love baking but I'm a lawyer. I might study patisserie at Cordon Bleu in Paris this year, but it's a hard decision, because it might imply leaving my lawyer career. I've had your food in the US in the Wolfgang Puck Café, when I was about 14, I had my first créme brulée there, it was great! I am good fan of your food and every time I go to States, I visit your Restaurant. I know you are a celebrety chef and I wonder whether you are doing any efforts to feed the poor in the world community. Any suggestions to improve the quality of food (nutritious) for a common man, while maintaing the taste. I was moved and inspired to write you chef puck,i will like to know if there will be an enrolement to be your student in U.S,want to be a proffesional chef.again what will it cost me to set up a mini restaurant in the state?